IN LAST WEEK’S article, we quickly ran through 15 of my top training tips and this week can be treated as part two of that as we focus on nutrition. A lot of the time we can brush the basics aside as we’re swamped with complex information which just makes everything a little more confusing to digest. Let me start by re-emphasising that I am not a nutritionist, dietitian or am not affiliated with any supplement store or brand. Instead, I will try and cover the basic information in an honest way and give you the advice I offer to my clients. Nutrition can often be a minefield and in the last ten years of working in the fitness industry I have seen fat-loss fads and different myths leading people down the wrong path; diets, quick fixes, magic pills and certain supplements. 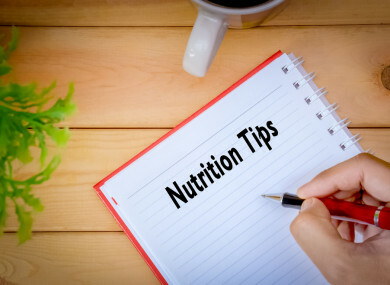 Here are 10 of the my top nutrition tips. I have talked about this area before in the column and it’s the best approach to maintaining a fit and healthy lifestyle. 80% of the time, just eat real food; fresh meat, fish, green leafy vegetables, fruits, nuts and seeds. And also allow yourself to let loose a little by treating yourself with foods which should be eaten in moderation. Eating 100% ‘clean’ is a path that is actually quite unnecessary and has proven to lead to a crash and binge down the line. So go have that pizza or ice cream, but just don’t overdo it. What works for me or you, may not for someone else. We all have different goals, body types, hormonal systems, activity levels, lifestyles and surroundings. Don’t be fooled by going down the same avenue just because it seems to work for someone else. We all need different training regimes depending on our goals and your diet should be treated the same. Just because a certain diet or approach worked for one individual doesn’t always mean it will work for you. Sure, if you both get some of the basics mentioned below right together that’s a great start but you may need a few little tweaks to your own personal plan. Most of us should know at this stage the basic information on how and where to start in relation to living a healthy lifestyle. The biggest obstacle I see is that people know what they need to do most of the time with the basics but a lot of the time they don’t apply it to their daily life. I am not talking about things like macronutrients or what supplements but really basic stuff like junk food is not going to help you loose weight and water is good for us. A lot of the time we hear excuses like eating healthy is expensive and not having enough time to prepare healthy meals. You can eat healthy food without breaking the bank and time isn’t and shouldn’t be a factor. If it is important to you then you will make the time and effort. Measure your recommended caloric intake using any an online calculator. It’s simple –eating lots of calories with little to no activity will lead to weight gain. So get working on that; figure out how many calories you should be taking in with the correct macronutrient breakdown for your goals. This is very common with most clients I initially work with. I don’t blame them for this as a lot of the time we are quite unsure on macronutrient breakdown. My role as a trainer is not only to train my clients but it is to educate them a little better on how they can live a fit and healthier lifestyle. Let me start by saying that we all need protein in our diet; it’s not just for the lads and doesn’t always mean it’s going to make you look big and bulky. A lot of the time we just don’t get enough protein into our day. For more on this see a previous article here. This is a pretty obvious point but you will be surprised at the amount of people who are going about their day dehydrated. If you are unsure about whether or not you are dehydrated, then you could use a simple urine chart to measure what level you are at. This is something I come across quite a lot with new clients coming into me. A lot of the time they have been cutting carbs from their diet in the hope it’s going to help them drop body fat and look a little leaner. Generally within some time they crash, fall back into a binge and have to start all over again hoping it’s going to work next time around. For some reason we think that drastically cutting carbs from our diets is something that will work. What I suggest here is carb cycling and calculating the amount of carbs you need on certain days. Days you are a little more active that others can be a day when you can bump up your intake and days you rest and move less can be a day you can cut down a little. But the bottom line is that carbs are good and should be included for most of our goals. Time and time again I see people going down the route of buying certain supplements with the hope it can help them drop a little more body fat, improve their performance in the gym and aid their chances of losing weight. From working in the industry for the last decade, I can safely say that yes, some supplements do have a place for certain individuals but they should only be looked at once you have the basics covered when it comes to your nutrition and other lifestyle factors. Testing your skinfolds or even retesting benchmark workouts is something I suggest to clients every 6-8 weeks just to measure any progress and this goes for the same with your nutrition. If you have a body composition goal or performance goal in mind then initially once you start your new plan you should asses the number of calories you need each day along with figuring out all the grams of macronutrients you need to hit your targets. Guessing macronutirents and eating what you like with the hope that all the training you’re doing is sufficient, or even cutting out carbs, are areas I have seen people try but not sustain over a period of time. We have all seen it at this stage. The quick fixes, fat loss pills, 14 day transformations and the wonder supplements that will change your appearance in weeks — welcome to the world of fitness marketing. The truth is almost everyone in fitness is trying to sell you something. A product, programme, a diet pill or a magic quick fix. My advice here to you is if it sounds too good to be true then it probably is. Very rarely someone tries to sell you the truth; that there are no shortcuts. You can’t beat the basics of patience, hard work and consistency. It may be boring but it’s true. There are no magic pills, quick fixes or special training programmes out there that will have you dropping body fat within a week or two. Nothing worth having comes easy. If you are persistent, you will achieve your goals. If you are consistent, you will hold on to those goals. Email “Going back to basics: 10 of the most important things to get right in your diet ”. Feedback on “Going back to basics: 10 of the most important things to get right in your diet ”.